What is it that they say about smog? Oh yeah, beautiful sunsets. Make L.A.’s haze work for you at these cocktail bars and beachside spots, where the views rightfully rival the booze. 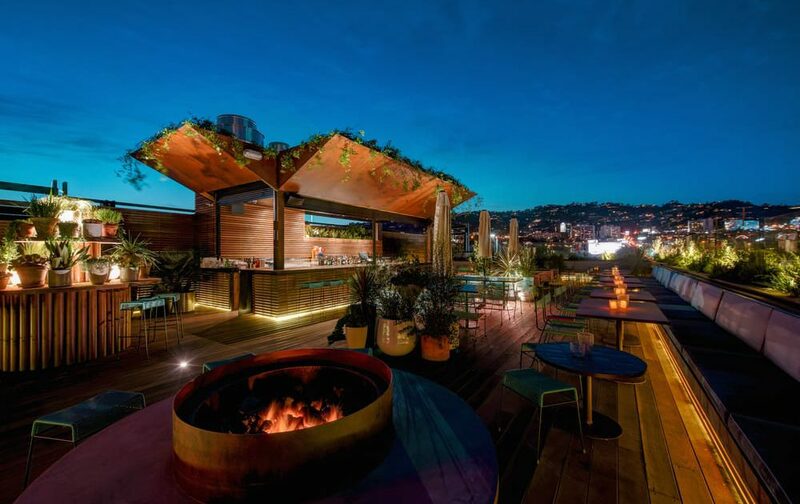 From Downtown’s bars with a view to seaside cabanas in Malibu and Venice, here are the city’s top (literally) rooftop bars. 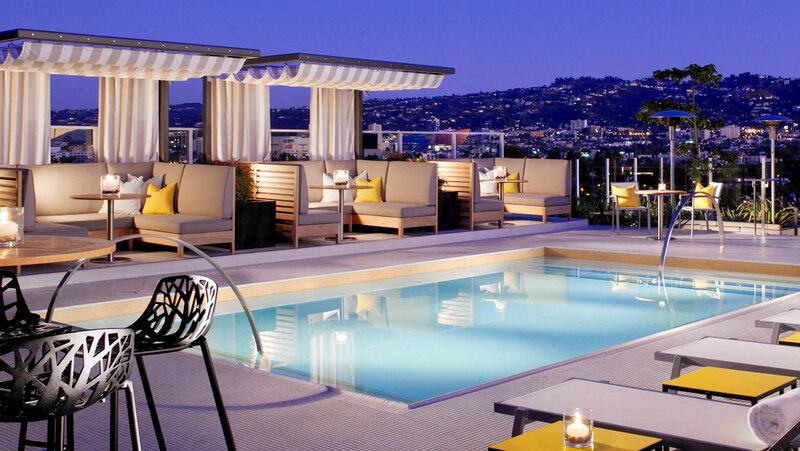 The Highlight Room takes over the rooftop and poolside at the mod hotel, which officially opens tonight with some of the sweetest views in Hollywood. 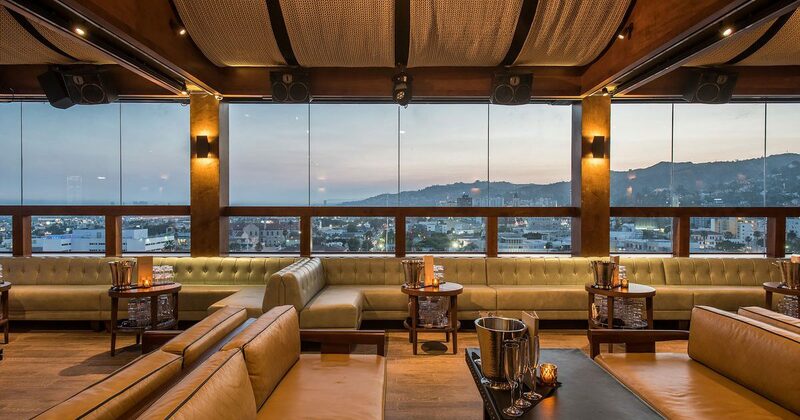 With clear cut vistas looking out to Hollywood and beyond, it’s clearly outfitted to become an evening party space, what with speakers galore, two DJ booths, and bottle service. 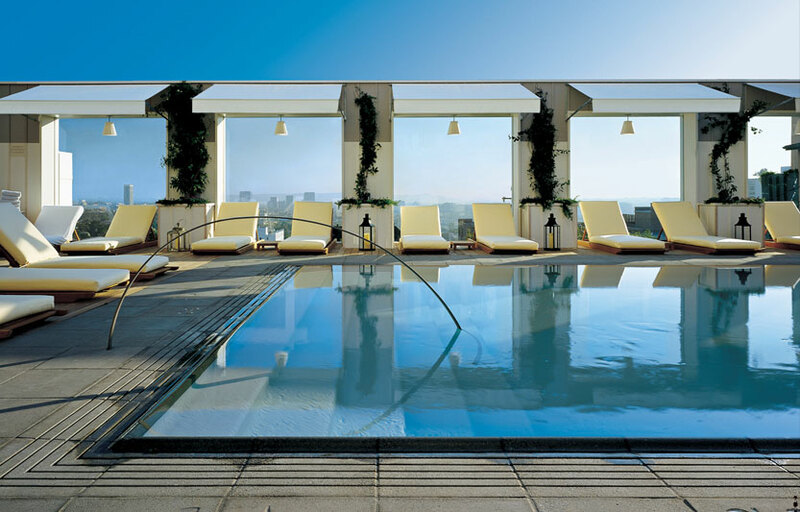 From weekend brunch—tuck into pancake lasagna as you sip on mimosas—to sunset drinks and bites, you’ll find full views paired with staycation cocktails and eats at the Hotel Wilshire’s rooftop restaurant and lounge. As nights get cooler, slip into one of the banquettes that line the pool and warm up with drinks like the Cue Southside, with gin, cucumber and mint; or El Ristocrat, with tequila, agave and bitters. This rooftop bistro is one of the prettiest in town with its patterned tile floors, dead-on view of the Central Library and potted trees full of twinkly lights. 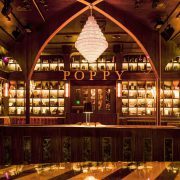 Downtown locals, plus a few hundred of their closest friends, sit on velour bar stools and plush sofas inside the eclectic boudoir-themed bar or fireside on the outdoor patio. From any seat, you’ll want to sample the wide selection of Kirs that go beyond Crème de Cassis—try a tasty, blackberry-flavored Crème de Mure—and other French by-the-glass pours. 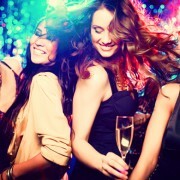 The after-work crowd drops in for happy hour, dubbed Apéritif Hour, weekdays from 4 to 6pm, while late-night partygoers can enjoy a live DJ on Tuesdays from 9pm-2am. Just off the hustle and bustle of the Sunset Strip, this West Hollywood boutique gem boasts boho-chic rooms with European touches and overwhelming charm. 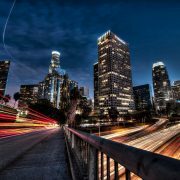 Take in the 360° vistas of Los Angeles from the rooftop (often overlooked by locals as a relaxing hangout spot), complete with outdoor pool, fireplaces, two bars, patio and garden, recognized as a hummingbird and butterfly sanctuary by the National Wildlife Federation. 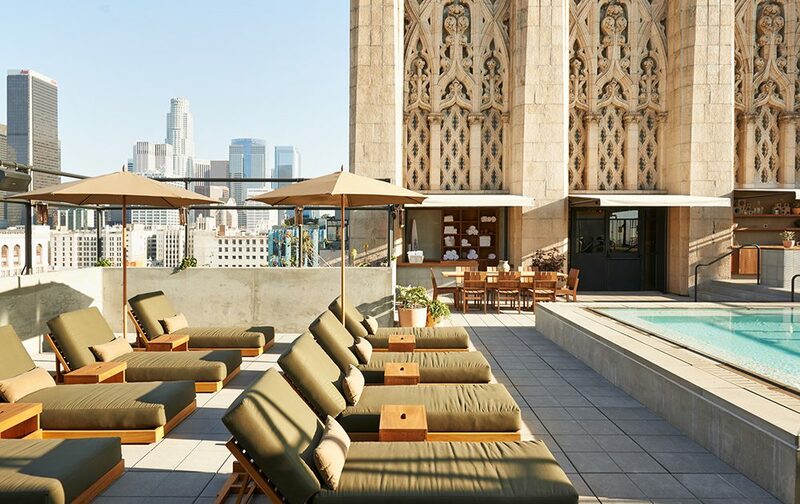 Beachside rooftops are in surprisingly short supply in L.A., making the Hotel Erwin’s High Rooftop Lounge an in-demand spot for sun-kissed Venice Beach locals. Even if you’re staying at the hotel, be sure to make a reservation. There’s nothing like a multi-hued sunset over the Pacific with a cocktail in hand to get Angelenos buzzing. Getting chilly? Evening bar-goers can stay past sundown wrapped up in one of the bar’s cozy blankets, along with a spiked cocoa or hot root beer float. If you don’t like your drinks sweet, stick to local craft brews to pair with midnight (gourmet) munchies like the mini lobster roll and a bacon, cream cheese, jalapeño hot dog. There’s a party happening at the intersection of La Cienega and Melrose—and while everyone is invited, not everyone may fit in. That doesn’t mean you shouldn’t give L.P. Rooftop a try, though. Located above E.P., a restaurant featuring a hodgepodge of Asian cuisine, you’ll find L.P., a rooftop bar with killer views and a swanky clientele. Share a pitcher of spiked bubble tea and Fijian nachos with new friends or industry colleagues as the sun sets on West Hollywood. If you’re lucky, you might be able to get into the super exclusive patch of rooftop known as Frankie’s, a private bar with daybeds. 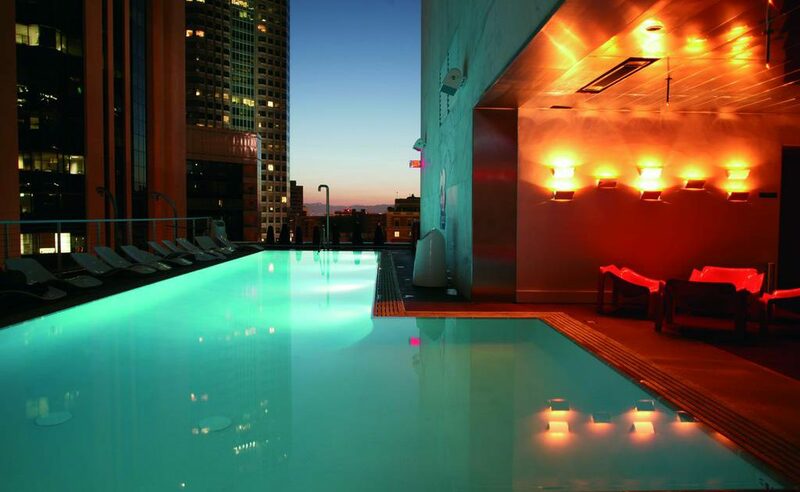 Even if you don’t hop in the pool, you can still plunge into the fun on one of the bright red waterbed pods scattered across the roof at the Downtown outpost of Andre Balaz’s hip hotel. Take the elevator up to the top, where mod furnishings give a slightly space-age vibe—the perfect backdrop for a crowd ranging from folks waiting for next year’s Burning Man to hotel guests checking out the scene. Weekend afternoons call for cocktail lounging—try the sweet and sour Hennessy Lemonade—but beware the $20 cover after 7pm, which doesn’t deter the lines that can stretch out into the parking lot. We’re big fans of Mama Shelter as a hotel and a restaurant, but once we saw the rooftop, we decided we just might move in for good. The bright space is splattered with multicolored sofas and chairs where you can lounge while waiting for shawarma to arrive; the Mediterranean-inspired menu also serves falafel, salmon skewers and a few hummus options. Cocktails also pay tribute to the Mediterranean, with drinks like the Za’atar Margarita and Mediterranean Mule. On warm nights, you can dance under the stars while DJs spin an eclectic mix of music, or take in a classic movie on their outdoor screen. 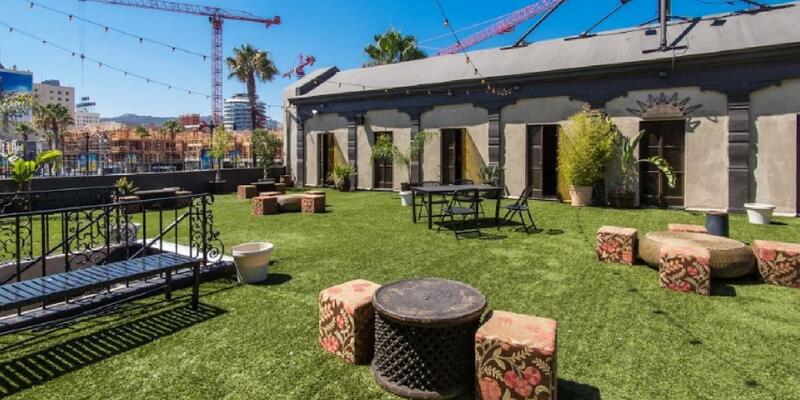 There’s also a fusbol table, a yoga studio and sweeping views of Hollywood. Like we said—we’re never leaving. Look good—but not like you’re trying too hard—when visiting Upstairs, a Moroccan oasis perched atop the trendy Ace Hotel. The elevator next to L.A. Chapter is your key to getting inside (or rather, outside) the buzzing, open-air roof deck, swathed in an exotic canopy and scattered with hip Downtowners clutching plastic cups. Perfect for an after-work schmooze or a reunion with old friends, you’ll find two bars to order a drink from (be warned: weekends bring the requisite long lines). Try the Lefty Lucy, a surprisingly easy-to-drink concoction made with chile liqueur, peach liqueur, ginger, lime and yellow chartreuse. The rooftop bar that started it all, the Mondrian’s Skybar still retains its secret Sunset Strip entryway, complete with dress-to-impress entry and nightlife cred—this is one of the rare poolside bars where people really do jump in after a night of cocktails. The all-ages crowd ranges from wide-eyed ingénues to aging Robert Evans types, but no matter where you fall on the spectrum, the Mexican-style oasis of flowering walls and gorgeous nooks will win you over, especially with a mojito in hand. Above SIXTY provides both a name and directions to this exclusive hotel bar. 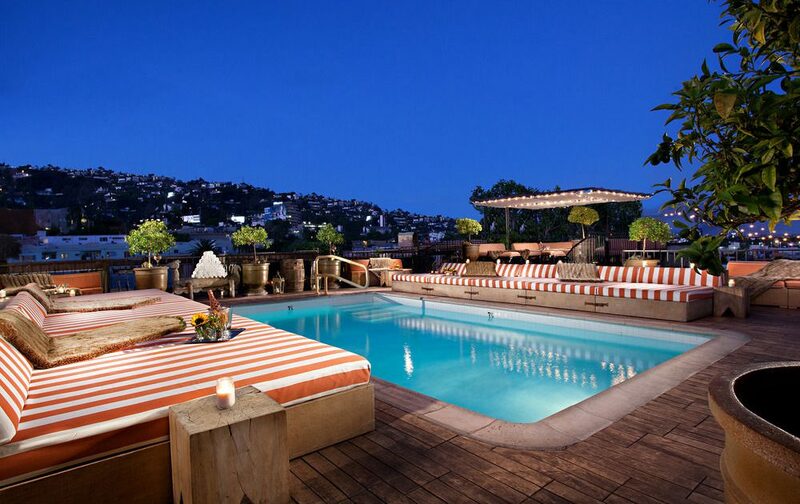 Open to Sixty Beverly Hills guests, members and cabana reservations during the day, this ritzy rooftop lounge is open to the public for a swanky bar crowd at night. The rooftop lounge offers wine, beer and cocktails, like the Strawberry Smash crafted with vodka and fresh muddled strawberries. Appetizers and meals, from kale salads to crab cakes, are also available on the roof of the sleek hotel, as are occasional weekend pool parties. You’ll pay a pretty penny for your libations, but it’s worth it for the view. A smoke break doesn’t mean that you’ll miss the show at Hollywood’s Fonda Theatre, where not only is the music hooked up to the rooftop “speakeasy,” but the live on-stage performance is also projected on the exterior wall. 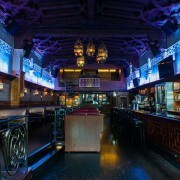 Unfortunately, you do have to buy tickets to the gig to gain entrance, but the prime perch—lounge on one of the scattered sofas on the outdoor patio—from the historic Spanish Revival–style building offers an unobstructed view of Hollywood as you listen to indie faves like Alt-J and the Alabama Shakes. Throw back a brewski and gaze down the boulevard as you channel your inner Dracula, performed on the Fonda stage soon after it opened in 1926. Forget flip-flops and sunscreen—dolphin sightings are de rigueur at this longtime PCH watering hole. With an outdoor lounge area lined with white beds and curtained booths that hang right over the Pacific, you’re practically within blowhole distance of the pods that swim close to shore. Catch afternoon rays at weekend brunch or laze on the sundeck at sunset or after dark, when Malibu locals turn out for margaritas and the salt air mixes with pretty young things. 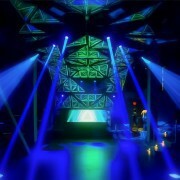 Sign up for guestlist and book bottle service directly on our free mobile app!